You'll be £8.00 closer to your next £10.00 credit when you purchase We Also Served. What's this? 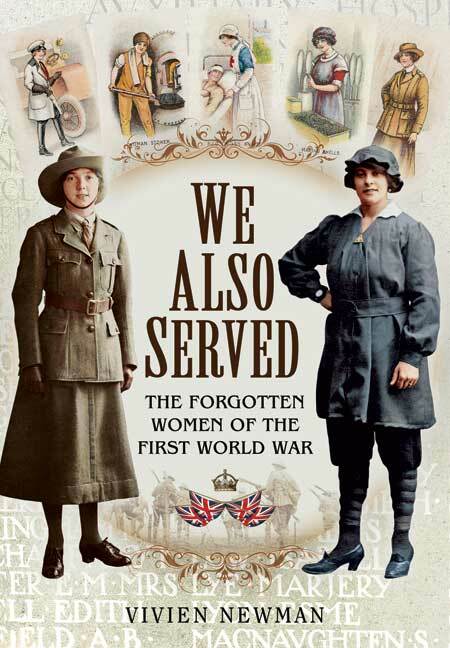 We Also Served is a social history of women's involvement in the First World War. Dr Vivien Newman disturbs myths and preconceptions surrounding women's war work and seeks to inform contemporary readers of countless acts of derring-do, determination, and quiet heroism by British women, that went on behind the scenes from 1914-1918. In August 1914 a mere 640 women had a clearly defined wartime role. Ignoring early War Office advice to 'go home and sit still', by 1918 hundreds of thousands of women from all corners of the world had lent their individual wills and collective strength to the Allied cause. As well as becoming nurses, munitions workers, and members of the Land Army, women were also ambulance drivers and surgeons; they served with the Armed Forces; funded and managed their own hospitals within sight and sound of the guns. At least one British woman bore arms, and over a thousand women lost their lives as a direct result of their involvement with the war. This book lets these all but forgotten women speak directly to us of their war, their lives, and their stories. A historically very interesting book. "This book lets these all but forgotten women speak directly to us of their war, their lives, and their stories." An interesting and enlightening book which corrects misconceptions of women's roles in the Great War. 'The Forgotten Women', well not any more! !.This fine account of the critical part played by women in Britain and with British forces during WWI goes a very long way to bringing forward the story of women at war. Highly Recommended... The author has comprehensively covered the ways in which women made a great difference during wartime. The text reads smoothly and debunks some of the myths. The photo plate section contains a range of images that compliment the text and add strongly to the content. This is an attractive and well presented book which is an account of the social history of women’s involvement in WW1. It reminds us that in August 1914 over three quarter of a million men were serving in our armed forces but only 640 women ( in the military nursing services ). Over the next four years women’s involvement in the war effort mushroomed and significant numbers of them died as they served. All in all a good introduction to an important piece of history which directly affected many of our families. Anyone interested in the role of women during WWI and indeed some more obscure facts about them would enjoy reading this, as well as those with a general interest in WWI. An intelligent and accessible exploration of women's oft-forgotten roles in WWI. This is a really excellent book covering women in the Great War... It is clear a lot of research went into the book and it puts women back on the WW1 map. This is a social history of women's involvement in the First World War and is drawn from the writings of hundreds of women which give contemporary insights into many aspects of women's lives during this time of conflict and historic changes. A compact overview of women's service during the First World War. So many books published about World War 1 focus on trench warfare and the soldiers who battled. But many other groups, while not experiencing the horrors of the front, fought their own war and one such group is remembered in this book. Vivien Newman brings to life the women of the war and the work they did, providing us with a comprehensive social history that is very valuable. This book lets these all-but-forgotten women speak directly to us of their war, their lives and experiences. As featured in the Braintree & Witham Times. It is very rare to read a story about the First World War that doesn't focus on the atrocities suffered by men on the battlefield, but one woman wants to change that by revealing the untold story of the war's women. This book lets all-but-forgotten women speak directly to us of their war, their lives and their experiences. ...a touching book about the women who served in the First World War. As featured on This is Local London website.